Mealtime should not be hard! 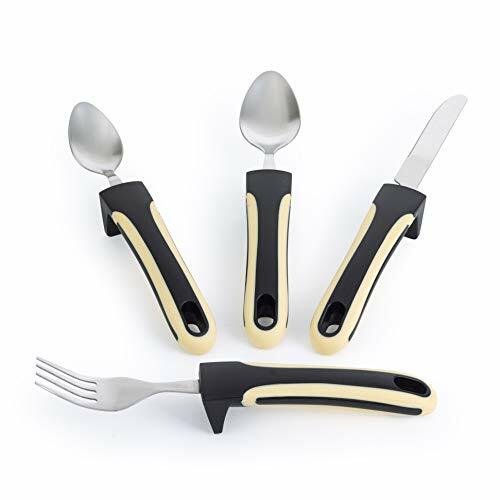 Make it easier for those with arthritis, tremors, or adaptive issues with this set of Weighted Adaptive Utensils. Weighted and Non-Slip Design: Easier to use than your standard utensils with our weighted non-slip design. Money Back Guaranteed: We will provide you money back if you are not satisfied with your order! 籠 ADAPTIVE UTENSILS: Ideal for people with shaky hands and/or limited or low muscle control. 籠 WEIGHTED UTENSILS FOR HAND TREMORS: These utensils will make mealtime easier and prevents shaky hands, weak hands or trouble with hand movements from affecting your ability to eat independently. 籠 ERGONOMIC WEIGHTED GRIP: Ergonomically designed large handles are ideal for those who struggle with dexterity issues and provide stability for weak grip strength. 籠 HIGH QUALITY STAINLESS STEEL: Our products are made with high quality stainless steel and are inspected thoroughly to make sure you have the highest quality on the market. 籠 MONEY BACK GUARANTEED: We will provide 100% money back guaranteed if you are not happy with your order! If you have any questions about this product by UrbanRed, contact us by completing and submitting the form below. If you are looking for a specif part number, please include it with your message.